I have a new bag tutorial up today at the Sewing Rabbit. 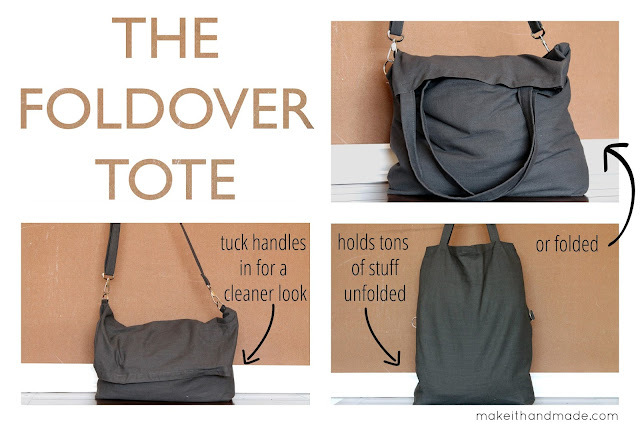 The Foldover Tote! Right now we've used it mostly to go to the library, and it's been life changing! I'm thinking of making a lined, pocketed version-- would anyone be interested in a pattern or tutorial for that? I would be more than interested in a tutorial! Love the look (and functionality) of this bag! Leave a comment, I'd love to hear from you! There is no word verification or log in required. Comments older than 30 days are moderated. I'll get back to you as soon as I can!